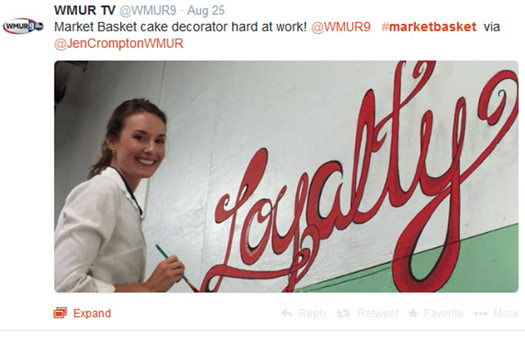 Talk about beloved brands often focuses on high-margin and/or high-end businesses. Think of Coach, Harvard, BMW, Apple, Nordstrom, and Zappos, all have devoted, almost cultishly loyal customers because they bring delight to them. And along with such strong customer preference comes the reward of premium prices to those loved companies. There is a tendency to think that such have this level of customer loyalty because they can afford to; that they have the resources to spend on the product designs and exceptional customer service that generates this devotion. While this symmetry of wonderful experiences at premium prices is true for these brands, the link isn’t required. That’s the genius behind the Delight Conference, which I’ve helped host over the last four years. Any company – regardless of size or income – can use insight, creativity and humanity to create connections that define such brands. In the video from the Delight Conference, I introduce the audience in Portland, Ore. to Market Basket, a discount grocery chain inNew England which is definitely not a high-margin/high-end business. Yet its customers and its employees are so devoted to the company that when the culture of the company was threatened when its CEO, Arthur T. Demoulas, was fired – those who loved the brand went on strike. In a day and age when most corporate CEOs can only hope that they aren’t publicly reviled, it was breathtaking to see people who have cut meat or bagged groceries, often for the better part of their lives, go to the mat for their millionaire CEO. And of course, doing this changed the company. This happened here because Demoulas, son of one of the company’s two founders, had built close relationships with employees. He was renowned for remembering birthdays, doing hospital visits and other things even for employees he’d only met a few times. He was also considered responsible for relatively generous employee salaries and benefits. As a result, workers and customers all thought his firing was a first step in a process of cutting pay and benefits and eventually selling the chain. OK, so it’s understandable why the employees were upset, but why were the customers? There are a number of reasons. For one thing Market Basket located its stores in places where the rents were cheap, which means they put them in a lot of places that didn’t have access to other supermarkets. If you’ve ever lived in a poor neighborhood you likely know how grocery stores add to quality of life through access to food, foot traffic and lots of jobs that don’t call for expensive formal education. If something is going to mess-up your grocery store, it matters. But also, the personal concern, fair pay and benefits built a culture that customers appreciated. Its common to see staff wearing name tags that say they’ve worked at Market Basket for more than eighteen years. 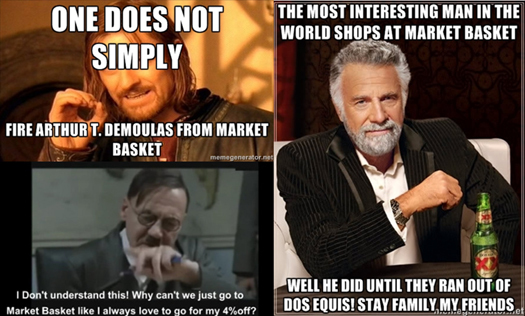 Market Basket doesn’t feel like just another discount store because the staff aren’t treated as ‘discount people’. The result: Real customer service and prices that could be as much as 20 percent lower than the competition. Decent people, awesome selection, lower prices – and an insane popularity where check-out aisles can stretch up the food aisles. Customers at Market Basket regularly use their best manners to navigate what can be a crowded store floor, and I expect this tone of civility starts with their staff. Somehow the difference between Heaven and Hell always turns out to be who you are there with. 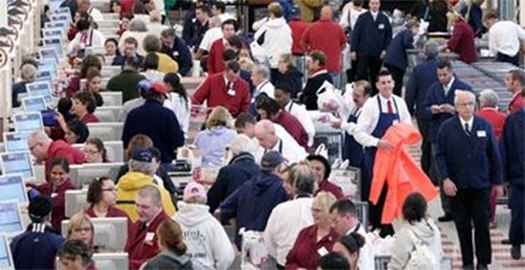 Price makes the store a bargain, but the people make it formidable. It’s a delight any company can make happen. And by the way, while the strike which I described in the video cost Market Basket money and loyalty while it was going on, once Demoulas was made CEO again, it actually wound up being a turning point. 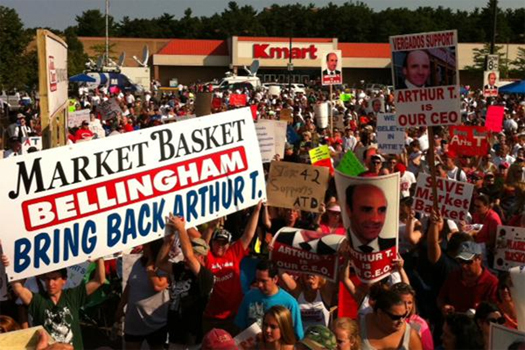 Last year Market Basket had total revenues of about $4.8 billion, the most in its nearly 100-year history. It is also in expansion mode, opening five new stores in the last year. The staff who went through this found customers had their backs. Management saw their business is both discounting food and valuing people – and that the regard of the customers and staff are as valuable as any owned asset.